Homemade Tortillas Recipe - from Bake.Eat.Repeat. 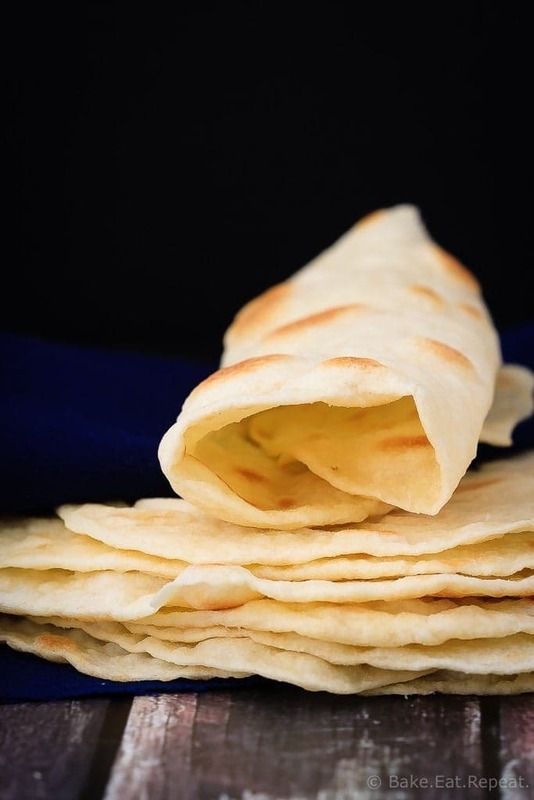 Easy to make, melt in your mouth homemade tortillas. 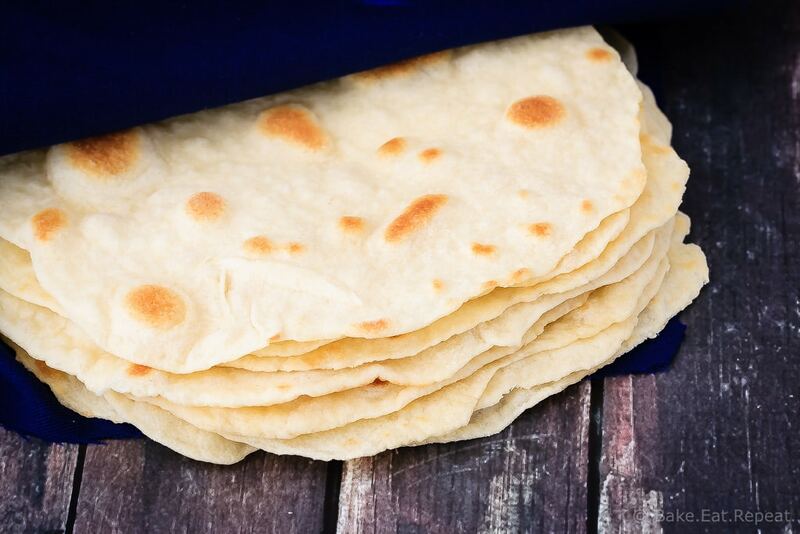 These tortillas are so much better then the store-bought ones – and easier then you would think! About a year ago, I started making homemade tortillas, rather than buying them at the store. You know, most of the time, cause it definitely takes a lot longer than grabbing that package off the shelf as you walk by! They are just so much better, that every time I give in to the convenience of buying them I’m disappointed and annoyed. They always stick together and have no taste at all. Homemade tortillas though? They are amazing. I first tried making homemade tortillas after seeing a number of recipes for them on Pinterest, and they were as good as expected. I had already started making most of my own bread at the time, so tortillas were the next logical step in trying to eliminate most store-bought bread. They are a bit time consuming, but the more I’ve made them, the faster I’ve become, and now I can roll and cook a double recipe in 30-45 minutes, which isn’t bad at all. So don’t despair if it takes a while the first time, it gets faster! I generally make mine at least half whole wheat, but have made them with just all-purpose flour too and they are divine that way. Also, I have made these using lard, shortening, butter or coconut oil, and all four of those options work well. I believe that lard is the traditional ingredient to use, but they all work in this recipe, and I haven’t noticed much of a difference in taste or texture depending on which I use. Go with your preference, any way you make them homemade tortillas are incredible and well worth the time! And it doesn’t matter if you can’t roll out a perfect circle, I sure can’t. It’s impossible. But the kids get a kick out of the crazy shapes that sometimes happen – and they all taste great! Update: Recipe and photos updated June 8, 2016, originally posted July 10, 2014. Easy to make, melt in your mouth homemade tortillas. 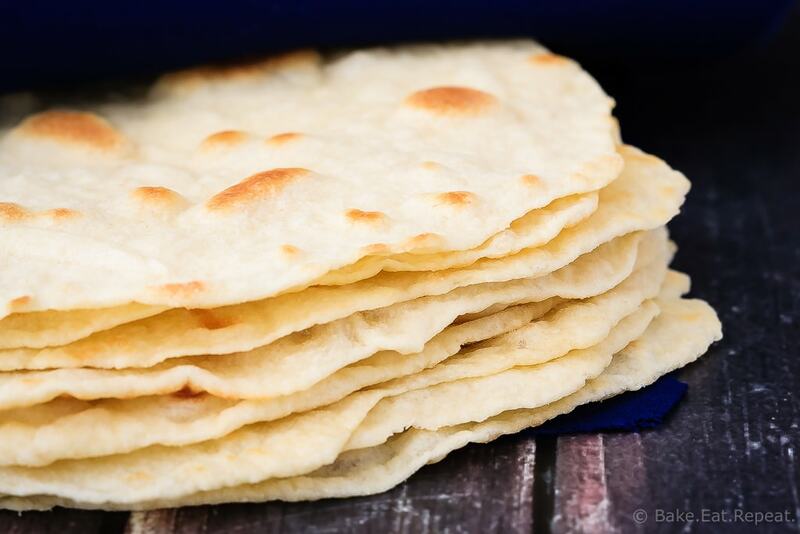 These tortillas are so much better then the store-bought ones - and easier then you would think! In a large bowl, whisk together the flours, baking powder and salt. Grate (or cut in) the lard (or whichever option you're using) and mix it together. It should resemble coarse crumbs and be evenly mixed into the flour. Pour in the hot water and stir until the dough comes together. Knead it in the bowl for about 5 minutes until the dough forms a ball and becomes less sticky. Cover with plastic wrap or a towel and let the dough rest for 1 hour. On a lightly floured surface, cut the dough into 14-16 pieces and cover again with a towel, allowing to rest for another 30 minutes. Heat a large skillet or electric frying pan to medium heat. On a floured surface, roll out one piece of dough at a time as thinly as possible. Make sure to use enough flour so it doesn’t stick to the counter or your rolling pin. I find there is less sticking if I flip the dough over a few times while I’m rolling so that there is enough flour underneath the dough. It should roll out very thin, and be almost transparent in spots. Don’t worry about it being a perfect circle, mine never are and they still work! Dry fry the rolled out tortilla in the skillet, about 30-45 seconds per side, until bubbly and golden. Repeat with the remaining dough. As you cook the tortillas, stack them on a damp towel, wrapping the towel up and over the stacked tortillas to keep them soft. If you’re not eating them immediately, you can allow them to cool completely on a wire rack (they can still be stacked), and then store in an air tight bag or container. Reheating them in the microwave briefly between damp paper towels will soften them up again. I generally make these at least half whole wheat, but I make them with only all-purpose flour when I feel like extra fantastic tortillas. I also usually double the recipe so that I can have some to freeze. The most traditional way of making tortillas is with lard (I believe), but I have made them with lard, shortening, butter and coconut oil and any of those works very well here so use your preference. Source: Adapted from A Sweet Pea Chef . I will like to ask, how do you freeze them? You still cook them first and then do you need to put parchment paper or something similar between each of them? You could if you're worried about them sticking together, but I usually just cook them, stacking them as I cook them, then let them cool completely. Then I place the whole stack into a large ziplock bag and freeze them. I haven't had any trouble with them sticking together once they're thawed, but if you're wanting to take one out of the freezer at a time you might want to put parchment or wax paper between them as you won't be able to separate one from the stack when they're still frozen. Thanks, Stacey. I am going to make this for tomorrow night. Usually my husband is the cook, so want to surprise him with this one! Good luck! Hope they turn out well for you! These sheet pan chicken fajitas are super fast and easy to make if you're looking for a recipe to serve in the tortillas! Like this recipe, however what can substitute Lard to make the same consistency? Instead of the lard you can also use shortening, butter, or coconut oil. I have used all of them and they all work well so use your preference. Oh I want to try this! I've never made tortillas from scratch before but they look absolutely delicious! I've never thought to make my own tortillas before, but now I need to start! I bet they taste SO much better than the store bought kind. These look so fluffy and delicious, Stacey! Definitely pinning this recipe for later! Homemade is the way to go! We don't eat them very often, but I always go with homemade ones.. and I love adding whole wheat like in this recipe if we're grilling chicken and topping with tzatziki. so good!